NOV. 25, 2015 UPDATE: Happy news! 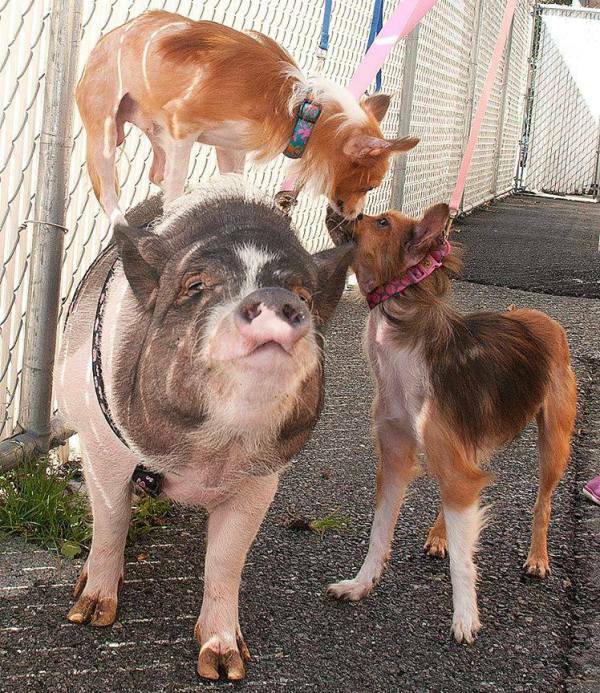 Paprika, Pickles and Pattie the Pig have been adopted together by Blue Hound Farm in Lewisberry, Pa., WPVI reports. According to the farm’s website, it’s home to horses, sheep, goats, cows, pigs, ducks and more. “Triple P” will be off to join the rest of the menagerie Friday. Paprika, Pickles and Pattie, who are inseparable, are ready to be adopted together into a forever home. Paprika, 4, and Pickles, 2, are female and male Chihuahua/Pomeranian mixes. Pattie is a 2-year-old pot-bellied pig. The trio, referred to as “Triple P” by the Animal Rescue League of Berks County, was left in the stray building at the Pennsylvania shelter in September. The one thing Triple P does not do together is eat, McKillip jokingly told ABC News, because Pattie the Pig will scarf up the dogs’ food as well as her own. When they were abandoned at the shelter in September, both dogs were infested with fleas and had little hair from the neck down. Two months later, they’re both flea-free, healthy and energetic. Both dogs are well trained. Like her two buddies, Pattie, who weighs 120 pounds, is also housebroken. “She’s obviously not small. She gets a little bit grumpy like some pigs do, so it’s a tough sell,” McKillip told WFMZ. So far, most potential adopters are interested in either the dogs or the pot-bellied pig, but not all three. If no one is willing to give Triple P a forever home, the shelter may have to separate the BFFs. “It will be heartbreaking to watch Pattie, because she would probably be the one that’s left behind,” McKillip told WFMZ as her eyes filled with tears. Potential adopters can try fostering Triple P for a few weeks to see how it works out before making it official. The Animal Rescue League will waive the usual adoption fees. If everything works out, “We will send them home with everything we have for them, and we will give you a big hug!” McKillip told WFMZ. Anyone interested in adopting Paprika, Pickles and Pattie can email McKillip at smckillip@berksarl.org or call 610-373-8830.